A one of a kind tension mounted grab bar. For seniors and those who lack mobility, falling is a common occurrence. These falls can have devastating impact for seniors regardless of when or where they occur. The dangers of falling are well documented. When you consider the fact that many falls go un-reported or un-noticed, these numbers are even more staggering. Fall prevention is a top priority for caregivers and independent seniors across the nation. After a fall, caregivers and independent seniors face a difficult decision of modifying their home or moving to a safer environment. Both options can be expensive and time consuming. For those that choose to modify their homes, permanent wall mounted grab bars are the most common way to help seniors prevent falls. While these types of grab bars provide solid support for seniors, they come with several downsides. Wall-mounted grab bars are confined to walls. They are only able to provide support if the person using it is in very close proximity to a wall. These grab bars generally require a permanent installation. That means drilling, screwing, and more often than not patching. Grab bars can quickly make a warm home feel like a hospital. Seniors or those who are at risk of falling need support in the bathroom, in the living room, the bedroom or any room where they may be moving around. They want their homes to be warm and inviting. After all there is a reason why most seniors don’t want to live in a care facility. Mostly, seniors don’t want to spend their hard earned money on expensive modifications to their precious homes. Given their lack of options in fall prevention safety products, seniors often feel like they must settle with unsightly and impractical grab bars. Fortunately, there is a new solution - a one of a kind tension mounted grab bar that can be placed anywhere in the home. 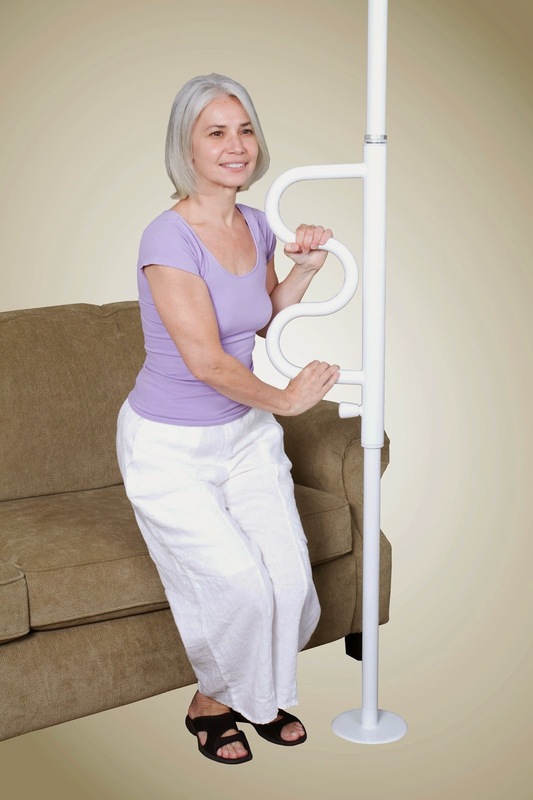 Unlike traditional grab bars, The Security Pole and Curve Grab Bar can be mounted in the middle of a room without any screws, drilling, or permanent installation. It can be placed next to the toilet, shower, couch, or bed. Its curved grab bar makes it easy to transfer from a sitting position to standing or getting out of the shower. The grab bar also rotates 360 degrees so that you can move it out of the way when not in use. Perhaps the most important feature of the Stander Security Pole and Curve Grab Bar is its look and feel. The steel grab bar has comes in both black and white and was designed to keep the home feeling like a home and not a hospital. 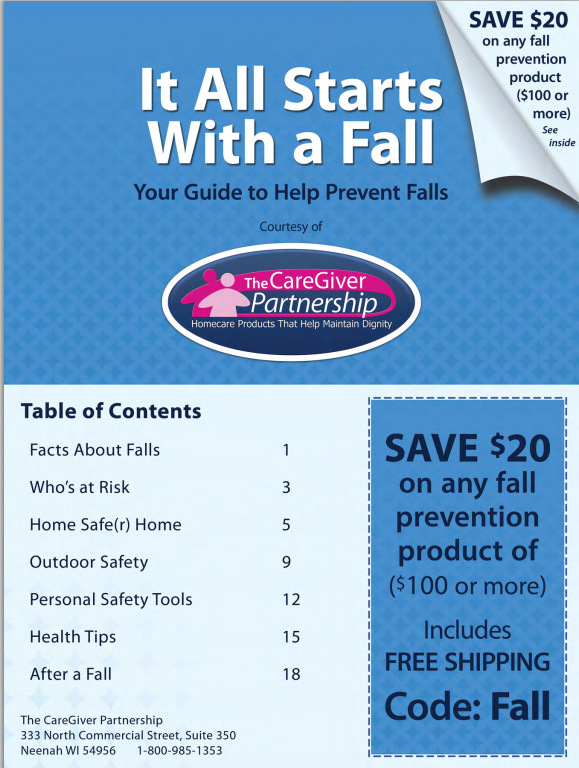 Download our Free 20 page ‘It All Starts With a Fall”, fall prevention guide which includes $20 in savings on Stander products. “It All Starts With a Fall — Your Guide to Help Prevent Falls” is full of facts, tips, and information that will help you identify and minimize the risk factors that affect health and longevity. It helps readers identify and correct fall hazards in their homes and yards, teaches about personal safety tools that can make living at home a success, and offers instructions on what to do if they fall or witness a fall. Download a free copy of the brochure. Other helpful ways to recognize Falls Prevention Awareness Day include distributing fall prevention brochures to neighbors; making sure senior loved ones have clean eyewear; encouraging the elderly to have vision, balance and gait, and blood pressure checks; and installing nightlights, nonskid mats and bathroom safety devices such as grab bars. 7 Reasons Why Seniors Fall + 3 Prevention Steps. From a Fall Prevention Expert.